Previously featured in our Lo-Carb Southern Fried Chicken recipe, here are the details of Caulitots – cousin of tatertots only low carb, tasty and easy. Missing a filling potato side with your meal? Why not try these cauliflower substitutes, they taste great and they are easy to make. 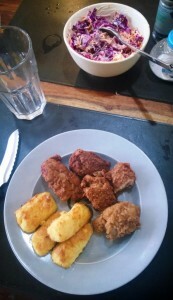 Shown here with Lo-Carb Southern Fried Chicken and a red cabbage coleslaw. 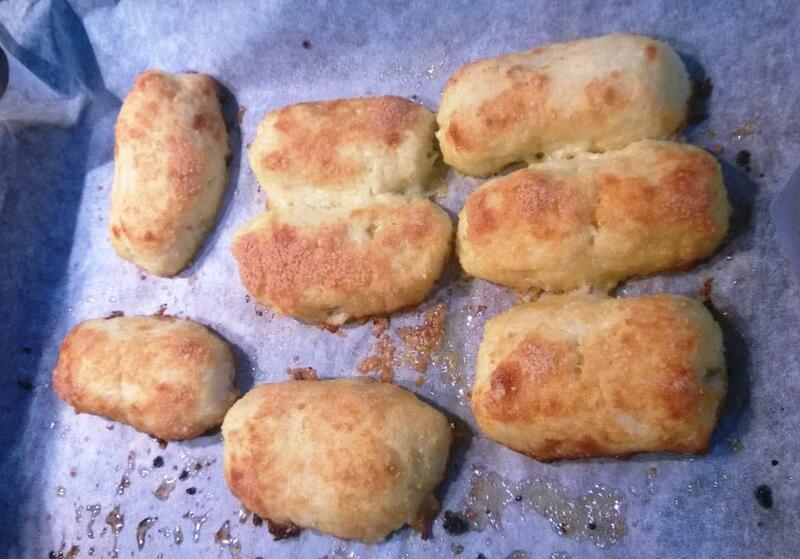 These are oven baked, we did try them in a deep fryer but they melted into the fat, even at lower temperatures. This is a basic recipe as with a lot of what we do here, feel free to add spices and herbs, different cheeses or other veggies. We also froze part of this recipe, so depending on the size of the cauliflower you will get about 12 individual servings – of course also depending on the number you eat in a sitting. I believe there was actually six per serving when i placed them on the place, don’t know why there is only four in the picture… RICHARD ! 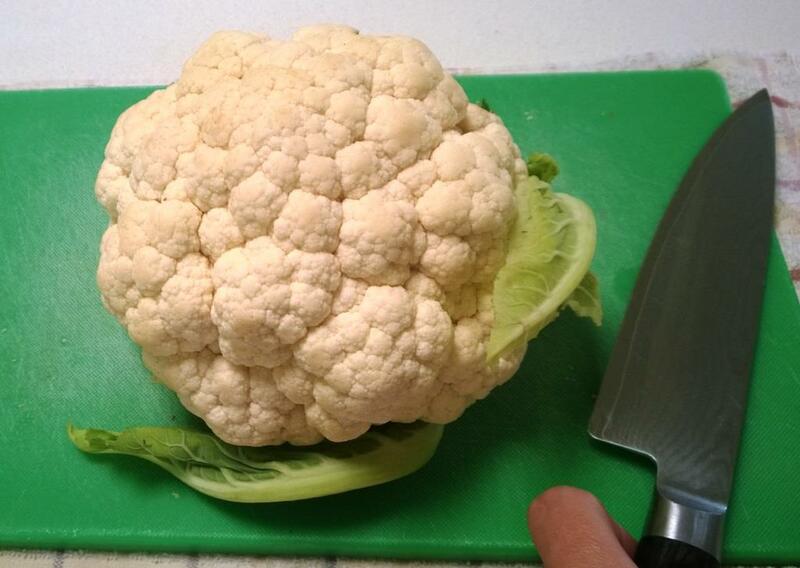 Ok, first things first you need a cauliflower – it should be as fresh as possible and the florets should be rigid (sign of freshness). Next remove the leaves and the end of the stalk – keep the rest of the stalk as once it is blitzed, its all the same and you get more out of the vegetable. 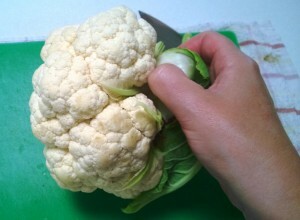 At this point the cauliflower weighs in at 700 g.
Then cut up into pieces of about the same size – I made mine about the size of a golf ball. The smaller the pieces are the quicker they will cook, but it takes longer to cut them smaller. 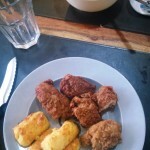 Place the pieces in a microwave safe bowl and add hot tap water for about 5 cm or 2 inches from the bottom of the bowl. You can also use a saucepan on the stove for this step – its up to you. Cook until the pieces are soft – you can put a knife into the stalk of a piece and it glides in with no effort and then falls off. 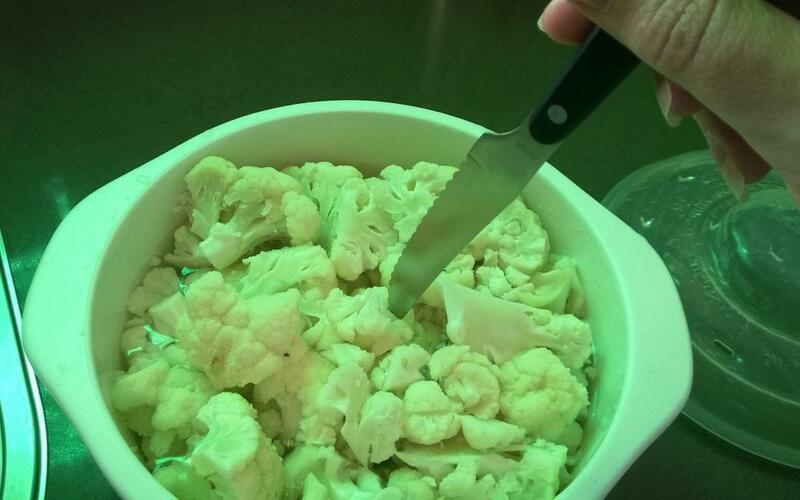 For the whole 700g of cauliflower it took about 6 minutes in our microwave – but each is different. The stalks should be losing their opaqueness but they should still be in florets. I recommend cooking in 2 minute blocks until they slide of the knife. 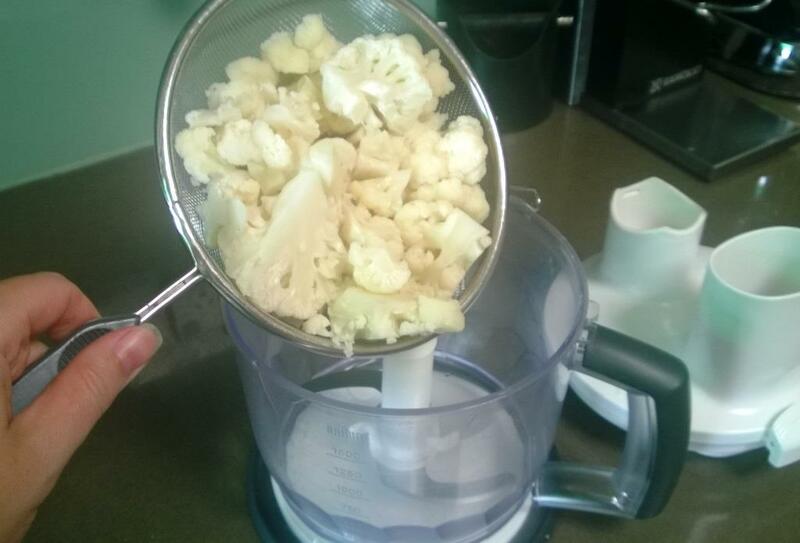 Drain as much liquid as possible from the cauliflower and add to a food processor. I just used a small one that attaches to a hand blender and this did reasonably well. 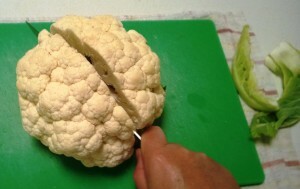 You may have to do this in batches if the whole cauliflower will not fit in. 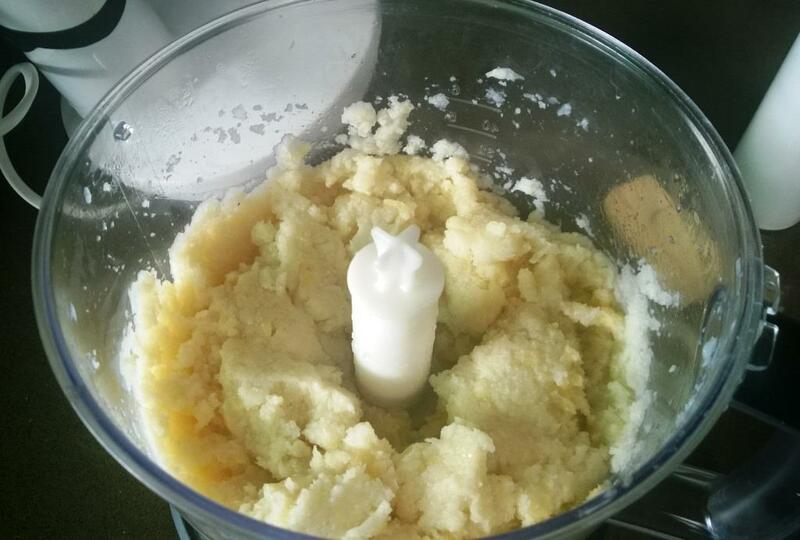 Now blend until it is as smooth as possible. As my blender is not that powerful this mixture still had some small lumps – but they did not detract from final result. Finally add in the mozzarella cheese, the egg and the salt. Blend until all mixed through well. Place on a lined baking tray and place in the oven and cook until they are golden brown. We tried to deep fry these, but they just fell apart in the fryer (you can see the remnants of these in the oven picture above). I recon you will need a flour of some sort to keep them together for deep frying. We’ll keep working on that recipe and when we nail it, we’ll post that here. The batter freezes really well and I cut the corner of the freezer bag to create a little piping bag to get the second batch to come out easier. I froze 2/3 of the mixture and cooked up 4 servings from each third. Remove leaves and the end of the stalk from the cauliflower. 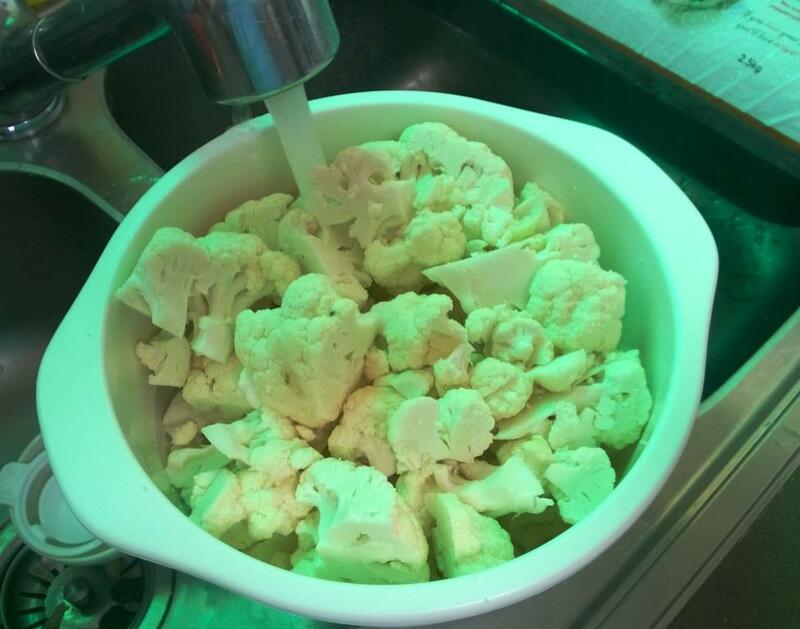 Cut up the cauliflower into fairly even sized pieces and either place in a microwave bowl with 5 cm (2 inches) of water and microwave until a knife will easily go through a stalk and the floret falls off knife. Or boil/steam on stove top until done. 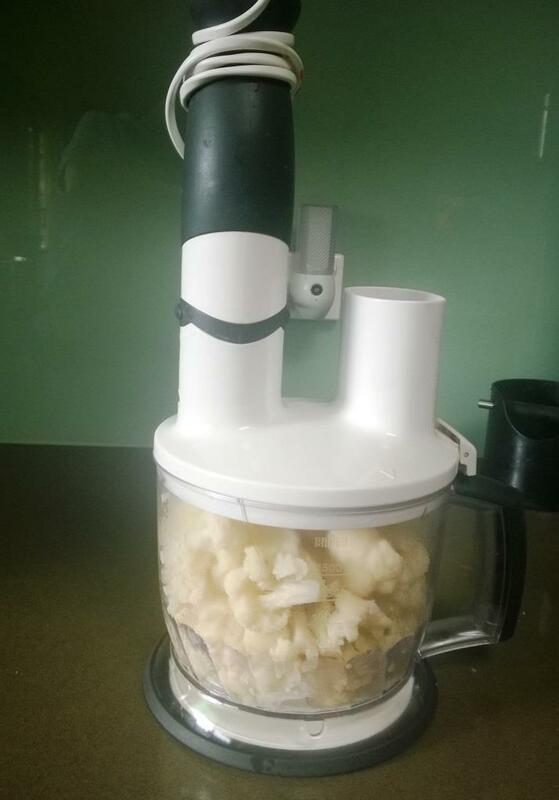 Drain and place the cooked cauliflower into a food processor and blend until it is reasonable smooth. Add mozzarella, egg and salt and blend until well combined. 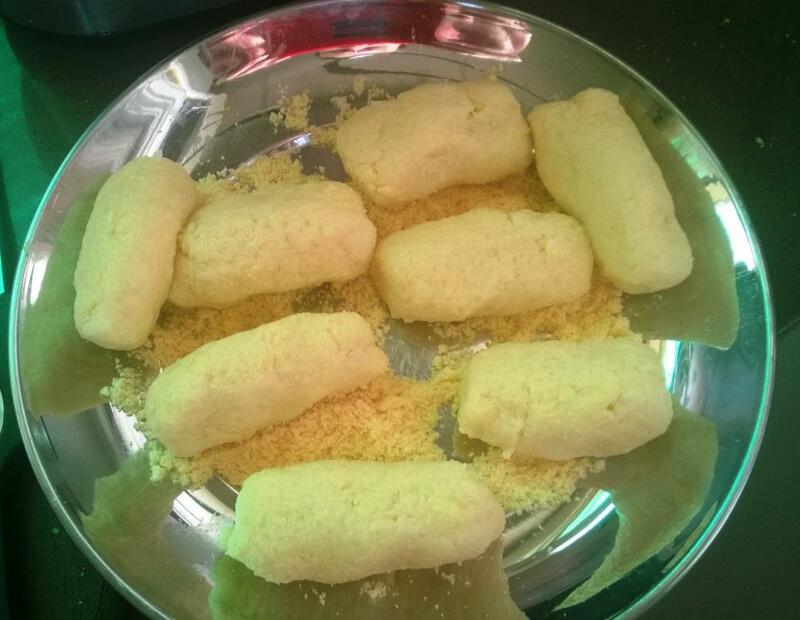 Mixture will be wet and does not hold together really well, but form into tater tot size pieces and roll in the finely grated parmesan to cover, place directly onto a baking tray lined with baking paper. Either spray with oil or place a small amount of fat over each tot. 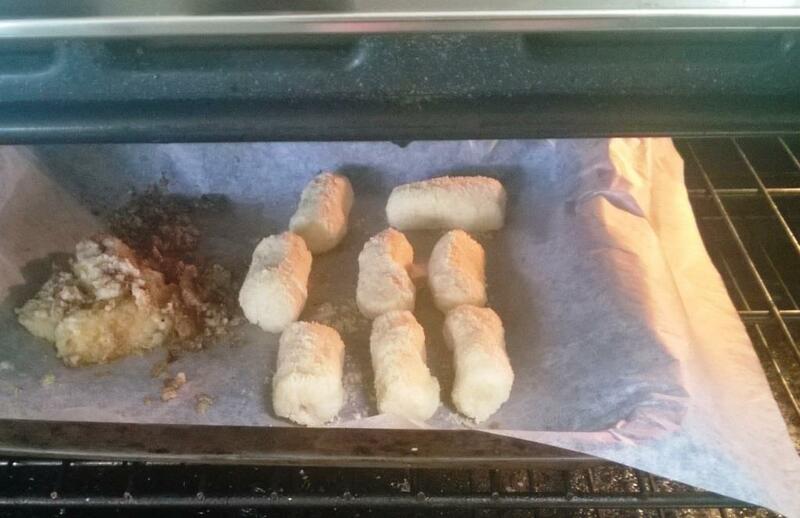 Bake in the oven for approximately 15 minutes - keep an eye on them they should go a lovely golden colour.